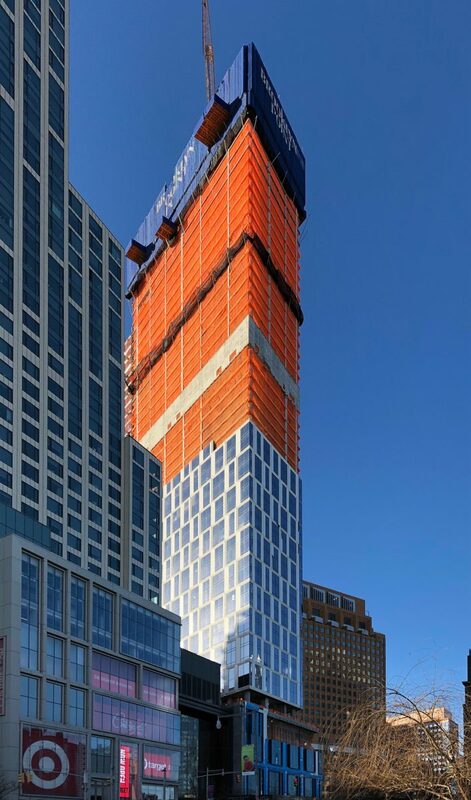 Construction is now reaching the 48th floor, with floor 49 forming behind the blue-colored cocoon safety netting. 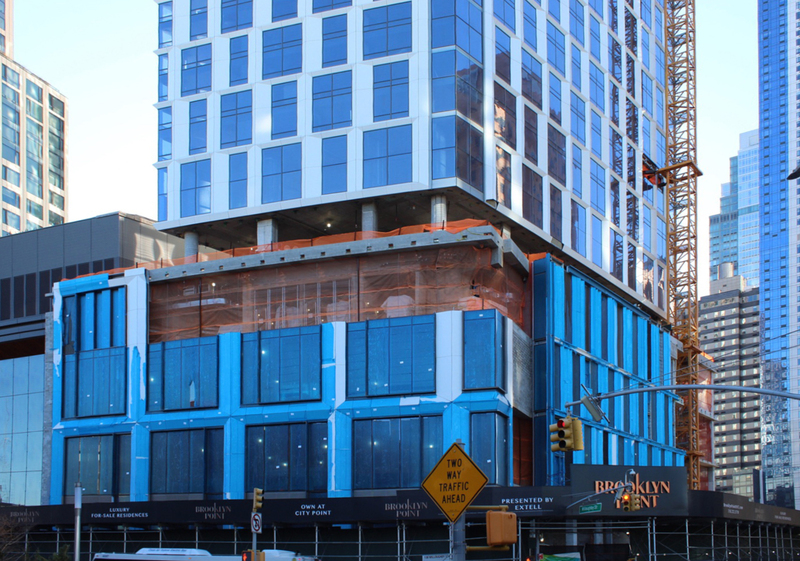 Looking at the eastern and northern elevation across the street, the sleek curtain wall on the lower floors is rapidly picking up the pace of construction. 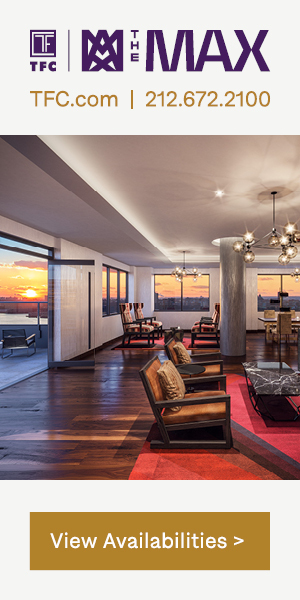 Above, the mixture of glass panels and multi-story, white-colored frames make the bold pattern of square- and rectangular-shaped windows stand out. The southern elevation is the widest side of the tower. The sunlight catches easily, and reflects off the white and glass panels. 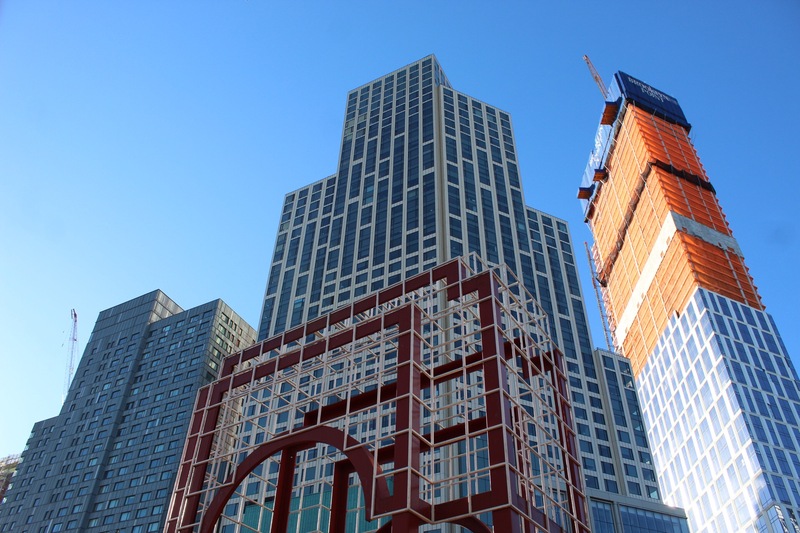 This tower is the third and final phase of the City Point complex, which boasts residential units, the DeKalb Market Hall below street level, the Alamo Drafthouse Cinema, a Target, a Century 21 department store, a Trader Joe’s, multiple small indoor retail shops at ground level, and quick access to the DeKalb station on the B, Q and R line. 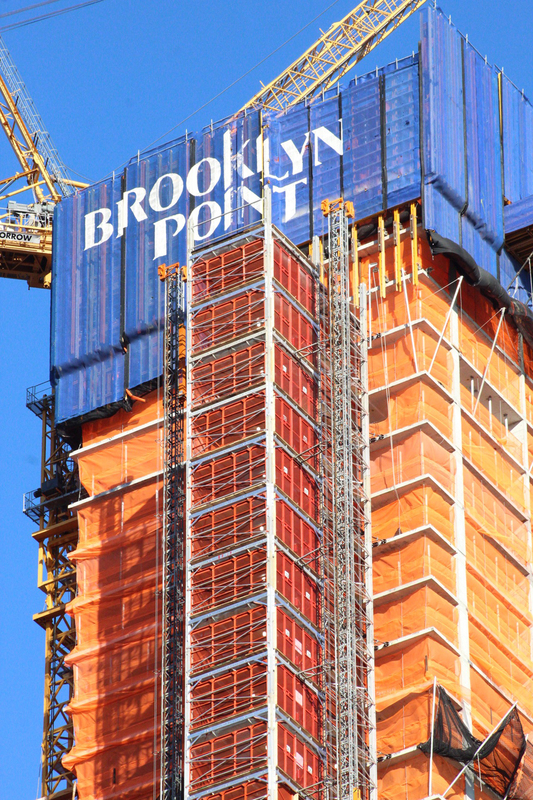 Brooklyn Point will most likely top off in mid-2019, while full completion is expected sometime in 2020. 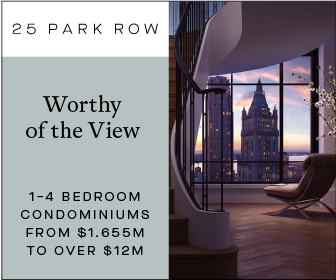 15 Comments on "Brooklyn Point Nears Topping-Out As Brooklyn’s Tallest Skyscraper Atop Flatbush Avenue, in Downtown Brooklyn"
please pardon me for using your space ; when i look at this much wow , and then looking out such views . Such views Donald Trump has! Exactly My Point. If This Is A Professional Paper It Shouldn’t Have Mentioned The Brooklyn Bridge And Flatbush Avenue Extension On The Same Sentence. Rather It Should Have Said The Manhattan Bridge And The Flatbush Avenue Extension. The Fact That ChampionShip Sports Names This Brooklyn Rebirth As The Brooklyn Renaissance Should Be Reason Enough Not To Make This Silly Mistakes Especially In The Main Website. Shame On The Writer For Not Doing Its Due Research! 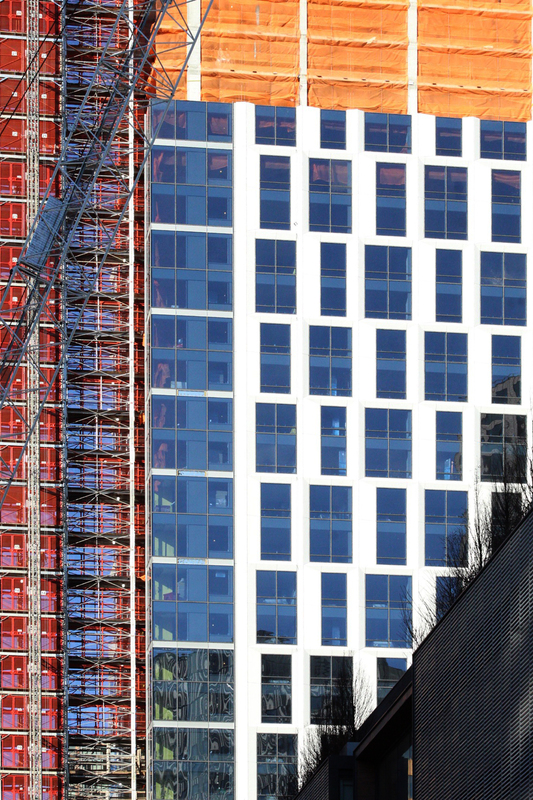 Interesting, so cladding suggest that at least lower apartments are duplexis, just look how white concrete division of it separate glass on their each of second floor. 59 story tower claimed 720 feet, and if bottom 26 floors looks like 10 feet each at most per floor, are duplexis this mean only 13 floors count then 40 floors standard not duplexis, and 4-5 story podium. 57-58 floors total 2 wide mechanicals, 59. Actually 57+13,since I count them as duplexis will be 70 stories, if you look original 2010 rendering plans it was this amount were planned, so developer didn’t reduce number of floors, just counted lower 26 floors as duplexis or 13 in this count. So, 48-49 floors are actually minus 13 will be 35-36 of planned 57-58 floors. Real number of floors is a mystery for this building. And building looks like 500 feet now far away from 700 feet!!! 57 story, is 4 story podium count(? ), then 13 stories of duplexis, but actually 26 floor plates, then mechanical space and another 40 floor plates or so including upper mechanicals. Total number is 57 floors, plus residential lobby, 58, a second mechanical space looks like built now then upper portion to the rooftop. Who will have tallest in the city roof pool, over 700 feet over street level. Agree, it may top out somewhere mid 2019, now on 49 floor count, out of 67 if you browse articles about this tower, developer tried hard to get this tower approved at 57-59 floor declared. Tower have prominent position from Manhattan motorist arriving from Manhattan Bridge, on other side of Bridge is 72 story 847 feet One Manhattan Square. And since it is few foot less of 850′ is claimed as 800 feet tower. 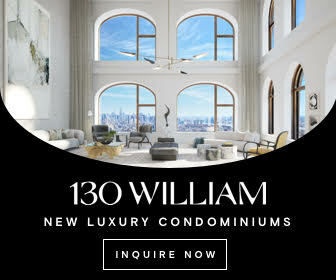 800 feet is ok to Manhattan, but close to 900 it’s beginning of “NYMBI wars”, nearby even 700 footers towers are on the chopping block, they are too “skyscraperish” for Manhattan Lower East Side…if 500 feet it’s ok to them, if affordable for dishwasher who lives in Bronx. According to NYIMBYism!!! No Amazon, no new 25,000 $50++ per hour jobs, everyone should guarantee $15, rich people tax and 50 trillion debt, what’s not a limit and “doesn’t matter” according AOCortez people…. Every dishwasher from Bronx must afford to live in the Trump Building on Fifth Avenue, even our Dollar fate will be a German Mark of 1921-23 or debt looming past 50+ trillion dollars, as soon dishwashers from Bronx will be able to rent affordable apartment near Central Park and billioners paid 99% of their wealth for AOC Green FY Schemes!!! Not affordable for AOC voters…. Make Central Park Green!!!! Built affordable and green painted concrete panels Green buildungs there!!! And Green painted HSR station to connect it to former LAX… Just 22 hours ride!!! Thank You AOC!!! Agreed. It will top out at 57 floors which will = ~69-70 stories? 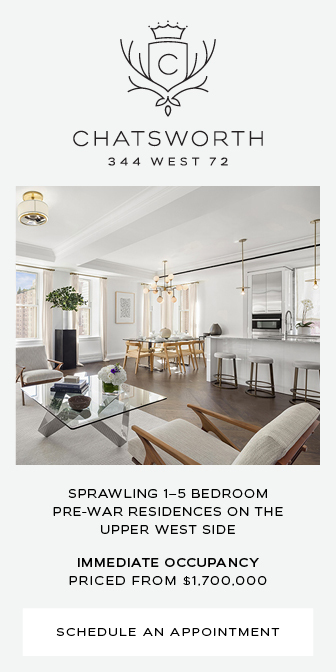 The duplexes are in lower retail floors and some lower floors. The floors also have varying ceiling heights which increases the amount of stories. Rooftop pool will be on 69/70. City point tower II is 515ft to architectural tip. Driving from the east (Qns/LI), bklyn point building is much higher than that already. Estimate ~ 610 – 630 ft now. Take a look from the east or west. “encompass” is the wrong word in the opening sentence. yimby needs an editor. Maybe I’m wrong, whole building just use looks like duplexes units, but this just for making impression that building have less floors as it actually built. Anyway 720 feet is real Skycraper height, just 60 feet less than 55 Hudson Yards, or just 30 less than Time Warner Center. Even in meters is impressive like 220 meters. How many towers are built in whole Europe taller than this in any single European City. And how many cities in America have towers over 220 feet, outside of NYC!???? With this tower Downtown Brooklyn finally make a full statement, it’s now became a real Skyscraper City within NYC by it’s own!!!! Whole City Point is true mega development, with over 1,000 apartments in 3 towers upon completion Brooklyn Point, and big shopping center with Alamo Theater, over 900,000 sq feet of Retail including Brooklyn Point retail portion. How many shopping malls in Manhattan like this, and this a second big mall in this area after Atlantic Terminal Mall Center with over 1,000,000 sq feet!!!! And buildung nearby under construction are including supertall 9 Decalb, 36 story new office building, 36 story Cadman Plaza Skyscraper, 51 story Hoytt Skyscraper, 14 story Wheeler office complex. And more and more coming!!! So, while currently City Point complex is 4 story mall podium for 2 towers on the top 19 more floors for rental tower and 30 more floors many of them are duplexes for City Point market rate tower, 4 story mall in podium is 640,000 sq feet already. 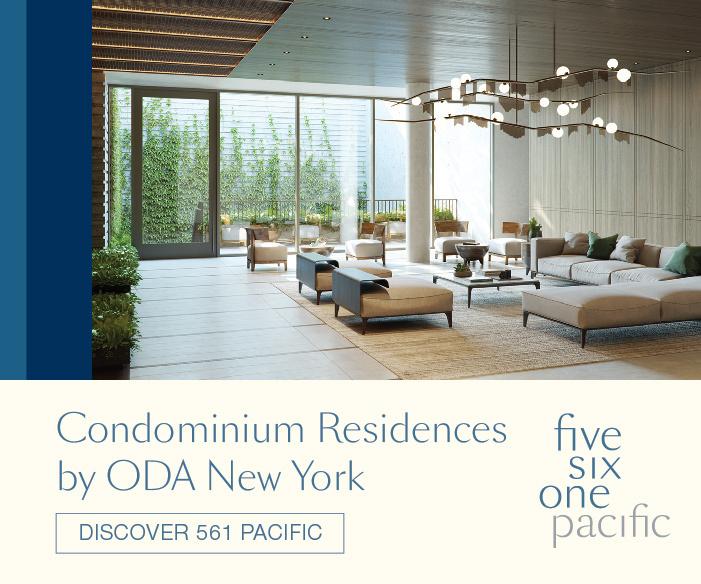 Is just 80,000 sq feet less than new Hudson Yards Shops and Restaurants. And this will be another 275,000 sq feet after Brooklyn Point is finished. After looking to rendering I was wrong this tower have 27 duplexis like double floor division, I don’t think this a duplexis only, just design of outer cladding. Divided in the middle by mechanical space double floor 13×2+2+13×2, then rooftop mechanicals and infinity pool, btw infinity pool is highest in Western Hemisphere, so this means 52 residential floors, and 4 floors of mechanical space up to rooftop, over 5 story ammenity community space, not a retail, except restaurant, wine cellar room, so 61 floors maximum count, for marketing purposes it’s count as 68 story, for rooftop mechanical and pool, however maximum constructed floor plates same as promised by the developer earlier, 59 stories to the rooftop. Not count rooftop mechanicals. If skip 2 mechanical floors in the middle, this bring even to 57 floors count. So, over 600,000 sq foot of retail stays along and already completed as City Point Mall. Tower roof at 720 feet makes buildings one of tallest full residential building in NYC and temporarily tallest structure in the whole Long Island. 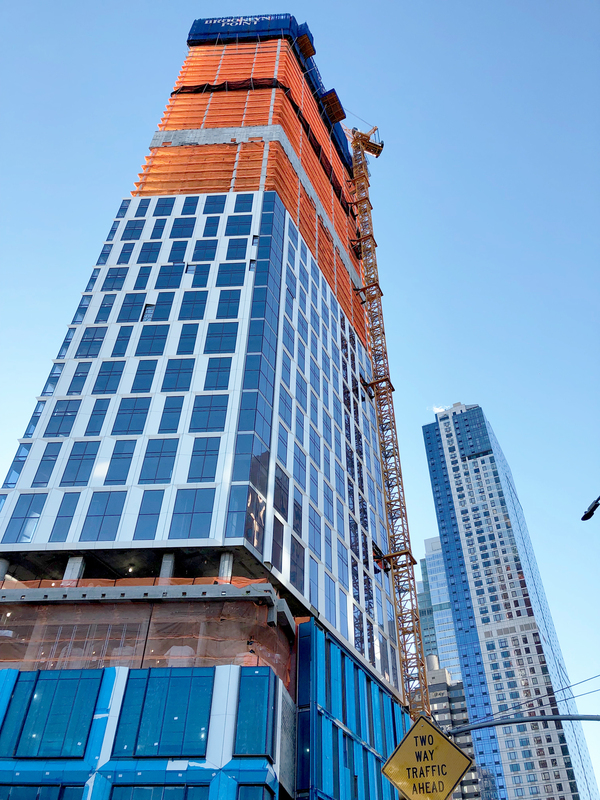 Until two towers in Queens will be finished and of course 9 Decalb and about 840 feet Flatbush Avenue Skycraper south. By 2022-24 this tower could be just as 5th tallest structure in Long Island surpassed by these towers above. 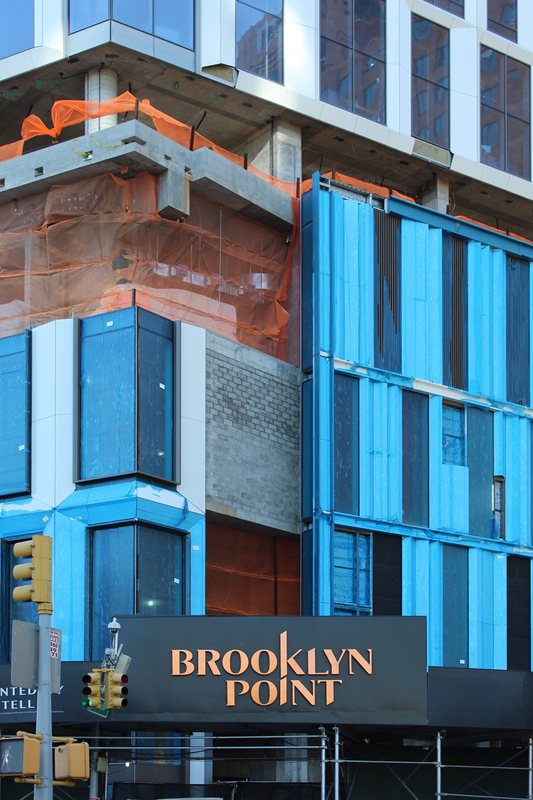 And with 2020 construction it will have a year or two as Brooklyn tallest, before 9 Decalb finished in 2022, we’ll see that. So far construction reached just 10-11 floors before the roof. 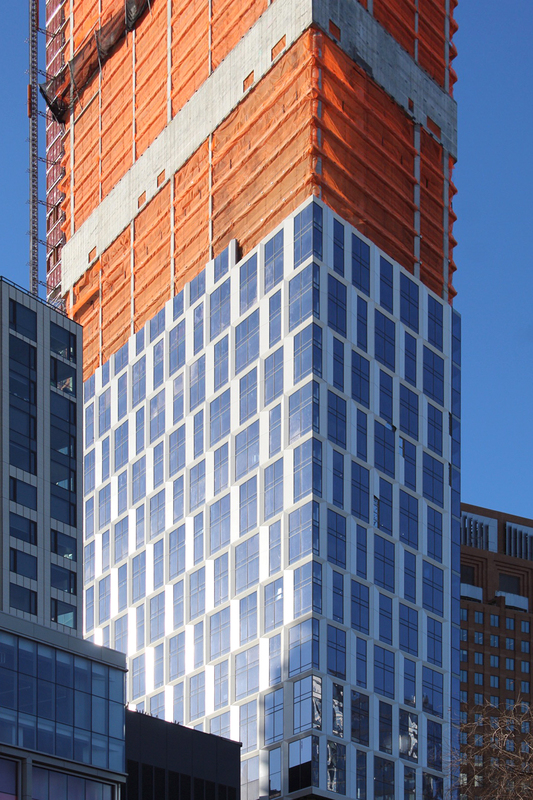 Making it already close to be tallest in the Borough at 600-620 feet. About 100-120 feet to the tower rooftop infinity pool!!! Agreed. The tower is around 620 feet tall already. We’ll see what this infinity pool looks like when construction is completed.